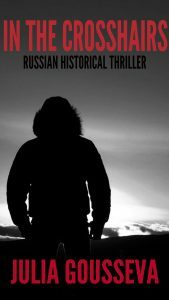 Gray Shadows, In the Crosshairs, and Lethal Cargo is a series of mystery books set in Russia featuring Nikolai Volkov, a veteran of the Chechen war and one of the best bodyguards in Moscow. Each book is a separate story, so the series can be read in any order. Bodyguards in Russia are different both from typical Western bodyguards and from the US Secret Service. They are a relatively new concept even for Russia. The National Association of Russian Bodyguards was founded in 1995, as a result of turmoil and high crime that followed the breakup of the Soviet Union. You can read more about Russian bodyguards and their training at this link. In post-Soviet Russia, greed and corruption are around every corner. With billions of dollars changing hands behind closed doors, the oil industry is the epicenter of new capitalism, new morals, and new money. When greed arrives at the international oil company in a small Siberian town, the life of its beloved director is in danger. Young, beautiful, and wealthy, Natalya Abramova seems to have it all. Of course, appearances can be deceptive. Natalya is impulsive and prone to bad decisions. That’s why her father hired Nikolai Volkov, one of the best bodyguards in Moscow. His job is to protect Natalya from herself as she travels to a small northern town for her first professional job – a Russian-English interpreter for the director of an oil company. An easy job, Nikolai thinks. But the town has a deep and dark secret, and Nikolai starts seeing signs of trouble hours after they arrive. A dead body on the ground that the locals explain as a heart attack victim, a newly constructed tall fence, and obvious signs of increased extra security around the newly built work compound are enough to put Nikolai on edge. As Nikolai gets to know the company and learns of the intricate web of blackmail and threats, he realizes that somebody is going to kill the director. Natalya is in serious danger. They need to leave as soon as possible. But Natalya refuses. Nikolai’s smarts, investigative skills, and combat experiences are challenged to the max as he puzzles his way through a variety of suspects, trying to identify and stop the killer before more people die. 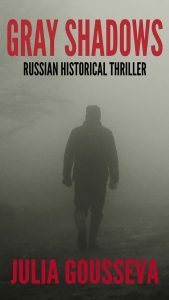 With a fast pace, unique setting, and intriguing plot twists that echo the headlines of Russian news, Gray Shadows takes you deep into the dark corners of Russian criminal world and presents a scenario that’s as frightening as it is plausible. Nikolai Volkov. Hero. Soldier. Warrior. An elite bodyguard and a top-notch investigator, he is one of the brightest stars in Moscow’s VIP Personal Protection Agency. But in every warrior’s life there is a turning point. One case. One messy, tangled case that can shatter a career and make him question his own values, morals, and loyalties. For Nikolai Volkov, this is that case. Moscow, Russia, the turbulent 1990’s. The last vestiges of socialism are coming down. The world is changing. And a man is killed on a quiet suburban highway. Then, an attempted kidnapping. Nobody knows if these crimes are related. Nikolai has a challenging mission: Protect your client, solve the murder, and get the situation under control. But the situation is impossible to control. Within hours, another man is murdered in his apartment. Then things really spiral out of control. But Nikolai won’t quit. He’s a combat veteran of the Chechen war with a passion for finding truth and doing the right thing. Before the social and political turmoil in Russia changed Nikolai’s life, he had planned to follow in the footsteps of his father, a decorated military hero. Now, he’s fighting a new kind of war. With the help of a young female investigator, he embarks on a deadly hunt that leads them from the glitzy Moscow downtown to a posh suburb to a desolate rural area where he confronts an enemy he didn’t know he had. 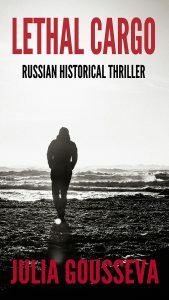 As he encounters and uncovers an intricate web of secrets and lies, Nikolai is forced to question everything he used to believe about his country, his career, his values, and himself. Things are rarely what they seem, but Nikolai is willing to risk it all to find the truth. What he discovers as he untangles the convoluted family drama are desperate desires, envy, and a murder plot more chilling than anyone could have imagined. Nikolai Volkov is a combat veteran of the Chechen war with a passion for finding truth and doing the right thing. After the fall of the Soviet Union, Nikolai embarked on a career of a bodyguard and soon became the best in the prestigious Centurion Personal Protection Agency in Moscow. He excels at protecting his clients and preventing crimes. But this time, his case is personal. His brother calls Nikolai with an urgent plea for help, and Nikolai heads to a small town in Crimea. The town is quiet and picturesque, but dark forces are at work behind the scenes. Murders, illegal smuggling, and suspicious arrests challenge Nikolai’s detective skills and put his life in danger.